Whatever you're looking for in a venue, be it a one-to-one meeting or a major conference or event, we can cater for all your needs. 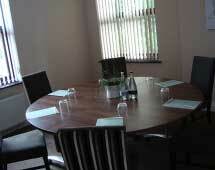 Our experienced staff can work with you to ensure your event is well organised and runs smoothly. Simply tell us what you want and we'll organise it for you with the minimum of fuss or expense. Our range of meeting and conference rooms can comfortably cater for 2 people right up to 100 delegates theatre style or 50 boardroom style and we provide Wi-Fi and all standard audio-visual equipment free of charge. Our coffee lounge is open from 7am daily. 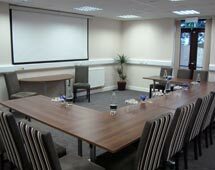 Our conference room is purpose built & is fully equipped with a ceiling mounted projector, electric screen and flip chart.